A number of new regulations introduced on January 1 including Rule 10.2b, which prevents caddies from helping their players with alignment over a shot as they "begin taking a stance for the stroke" - a rule which came under widespread scrutiny when Li Haotong was penalised in Dubai last week. Li incurred a two-stroke penalty for an incident on the final green when he had his caddie, Mike Burrow, behind him as he lined up a short putt for birdie, although Burrow moved to one side shortly before the Chinese star stood over the putt and rolled it in for what he thought was his 71st shot of the round. He was later issued the penalty in a move that met with disapproval and dismay from several leading observers as well as many European Tour professionals, with the likes of Lee Westwood and Matt Wallace insisting that Li was harshly dealt with. The new rule was under the microscope again on day two of the Phoenix Open at TPC Scottsdale when McCarthy was handed the same punishment, despite his caddie being stood behind him only while he was going through a series of practice shots. McCarthy's caddie moved safely out of the way before his player completed his practice routine before backing off and beginning his actual shot process, but he was later found to be in breach of the rules and his score was adjusted from eight under to six under at the halfway stage. The penalty prompted a similar negative reaction to that given to Li, with Justin Thomas tweeting: "This is ridiculous... the fact this is a penalty is mind blowing. USGA ... this NEEDS to be changed ASAP... there is nothing about this rule that makes the game better." 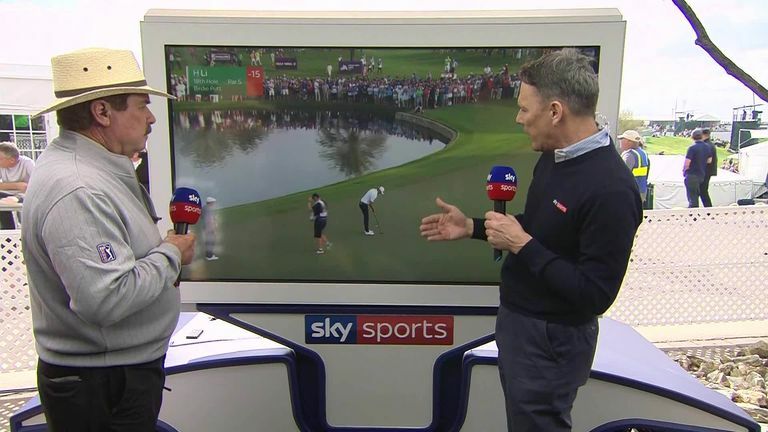 However, the PGA Tour then issued a statement midway through the third round announcing that McCarthy's penalty had been overturned, in part due to similar incidents involving Thomas and Rickie Fowler which went unpunished. The statement read: "Since the situation during Round 2 of the Waste Management Phoenix Open, which resulted in PGA TOUR player Denny McCarthy receiving a two-stroke penalty under Rule 10.2b(4), the PGA TOUR has been in constant contact with the USGA about how the new rule should be interpreted. "During the course of these discussions, this morning a similar situation from yesterday's round involving Justin Thomas was also brought to our attention. "It is clear that there is a great deal of confusion among players and caddies on the practical application of the new rule during competition, as well as questions surrounding the language of the rule itself and how it should be interpreted. "As a result, with the full support of the USGA and The R&A, the rule will be interpreted whereby the two aforementioned situations as well as future similar situations will not result in a penalty. McCarthy's score has been updated accordingly." The R&A and the USGA later issued a joint statement admitting that the ruling needed "clarity", and that an updated description of the new rule was imminent. The statement read: "The R&A and the USGA recognise that clarity on how to appropriately apply this Rule is needed. We are committed to assessing its impact and will provide the necessary clarifications in the coming days." Veteran PGA Tour rules supremo Slugger White paid a visit to the Sky Cart in Phoenix to explain the difference between the rulings involving Li and McCarthy, and hinted that the description of the controversial rule could be changed in the coming days.